Where Is the Democratic Outrage Over Spying on Americans? Under the Constitution, there are three branches of government. The FBI is not one of them. Instead, the FBI was created to assist the president in his job to enforce laws. Members of the FBI are called “agents” because of their agency relationship with the president. During World War II and then the Red Scare, the FBI's mission expanded to gather intelligence against spies. Here, too, the FBI was assisting the Commander in Chief. Even the word “intelligence” connotes this fact. The purpose was to help the president act intelligently against domestic threats. The FBI’s domestic intelligence gathering function caused understandable discomfort on the left. In 1970s apocrypha, President Nixon couldn’t wait to get the goods on undesirables like the Smothers Brothers. Or so we were told by the Smothers Brothers, back when the FBI's mission creep cast it as the Gestapo. In response to Nixon’s perceived overreach, liberal Idaho (before those words were an oxymoron) Senator Frank Church set up a commission to investigate domestic surveillance abuses. Technology, by then, permitted federal agencies to capture huge amounts of wire communications without disclosing their eavesdropping to Americans who were being surveilled. The result of Senator Church’s work was the Foreign Intelligence Surveillance Act of 1978 (FISA). It provided that the FBI could not use its technological capacity to secretly gather intelligence against an American without first going to court with credible evidence that the citizen was a spy. The statute required rigorous proof. Each warrant would only last for a specified 90-day term and had to be renewed based on the same demanding standard under which it was first granted. There were minimization procedures. The identities of persons who were not spies but whose thoughts and words were captured in the surveillance could not be unmasked, generally, unless national security depended on it. Eventually, as Senator Church had predicted, there did arise in America an effort to combine together in resistance to the government and elect an outsider who promised to drain the swamp. How did FISA perform? Here are the early returns. The House Intelligence Committee’s Nunes Memo, and the Senate’s Graham-Grassley referral, confirm that a piece of salacious and unverified opposition research – the Steele dossier – was presented to the FISA court for a warrant to obtain private communications relating to Carter Page’s involvement in the Trump campaign. The Democrats have issued a response to the Nunes Memo that has not yet been made public. But unless it says the unverified dossier was not used to get a FISA warrant, it misses the point. If Hillary Clinton’s opposition research was used to get a FISA warrant on an opponent’s campaign, the statute was abused. More, if a phony FISA proceeding provided support for the Russian collusion narrative that led to the appointment of an intrusive special counsel, then we are in Senator Frank Church “tyranny” territory. It is starting to look that way, too. This week it was learned that FBI Director James Comey attended a meeting before Trump’s inauguration, during which President Obama posited that “we cannot share information fully as it relates to Russia” with the new president. 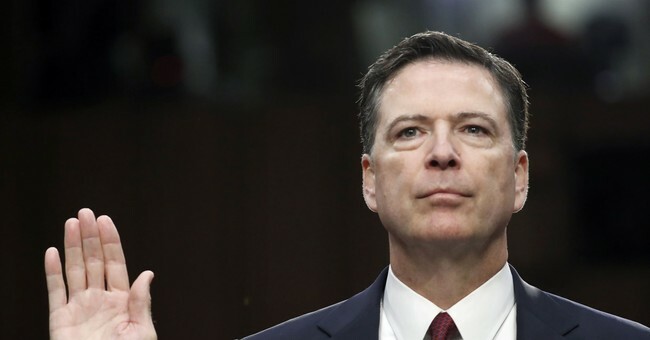 Instead, Comey – who was up to his neck in the FISA dirty trick – apparently saluted and said, “Yes sir.” When Trump took office, information meant to assist him in making intelligent decisions as Commander in Chief was kept from him. Comey remained Obama’s agent, and was eventually fired for his disloyalty. There has been an endless investigation, and nothing has been connected to Trump. Other than indicting some internet trolls yesterday on the theory that their Facebook and Twitter comments threaten our democracy, the special counsel has rolled snake eyes on the Russian interference front. He is leaving no stone unturned, though, and reserves the right to indict “Take This IQ Test” scammers for stealing the election. Perhaps the most amazing thing about this story is the lack of outrage. The great conceit of the left is that they are willing to stand for principle even on behalf of unpopular actors. Here, they have thrown principle out the window because they don't like Trump. That's messed up. In the name of Frank Church, in the name of liberal Idaho, in the name of the Smothers Brothers, the country needs your outrage over this, Democrats.